New York fashion writer Shammara Lawrence from Fashion Pop Queen headed down to the Fashion Textile Museum to check out the exhibition Fashion in Fiction which is juxtaposing their Belville Sasson that juxtaposes iconic fiction from the 50s through to the 80s from the classic literature including End of the Affair and the Go-Between to cult classics such as the creepy "Don't Look Now" and 80s pulp fiction and mini-Series block-buster "Lace" and Twin Peaks spin off "The Secret Diary of Laura Palmer"
Showcasing a wide array of novels some glamorous women were reading from 1953 onward - most of whom were the epitome of a Bellville Sassoon customer - the display, “Fiction in Fashion,” is set within the larger exhibit: “The Glamour of Bellville,” which is a retrospective on some of the most prominent styles of dress exhibited by the brand for over sixty years. 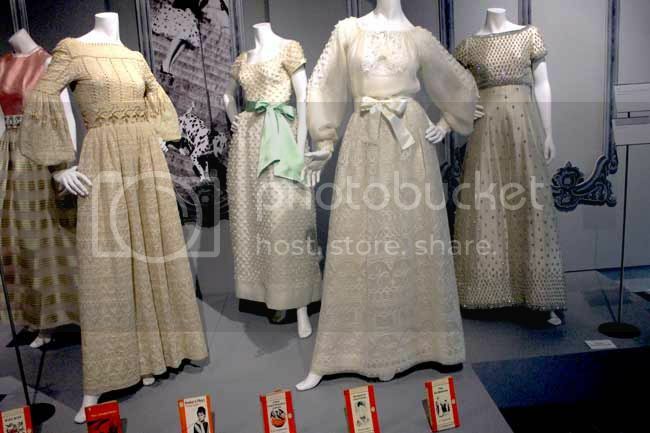 By utilising widely read novels to accompany specific dresses and pant suits from the brand, the exhibit illuminates social and cultural influences literary novels have had on fashion and that fashion has had over well-known stories within the 20th century. Playing on fifty years worth of designs and the classic evening wear aesthetic Bellville Sassoon is synonymous for, the design of the exhibition is an imagining of a couturier’s atelier dressed with pseudo-chandeliers hanging from the ceiling while clips of old fashion runway shows of Belville Sasson collections, evoking the luxury and romance the brand has thrived on since its inception. Upon entering the room, you quickly notice the careful curating of the clothing collection which is reflective of its cultural and/or literary influence. 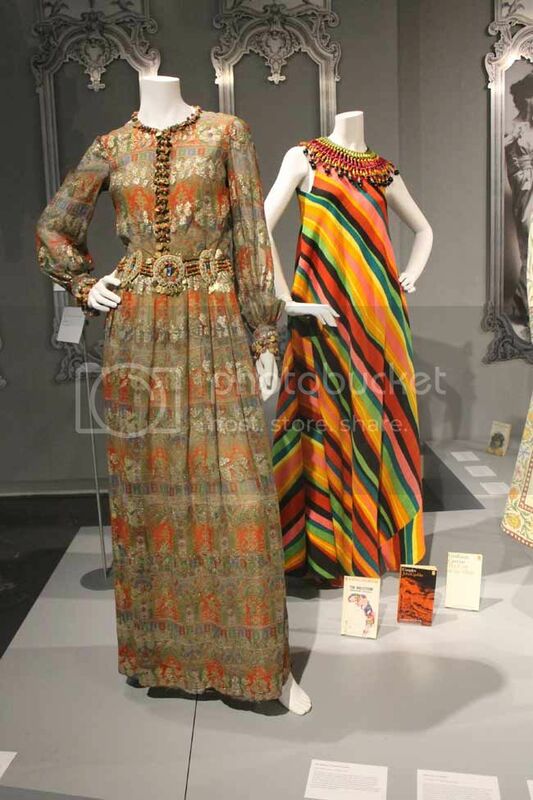 On the left hand side, there are multi-colored dresses accompanied by the novels such as The End of the Affair, whereas on the center-right of the first floor, the dresses tended to be neutral-colored, with some popular books such as Breakfast at Tiffany’s aligning the bottom of the platform. Case in point: where there was the novel Breakfast at Tiffany’s, there were cream coloured lace and sequinned evening gowns, which were indicative of the old Hollywood glamour styles depicted throughout the book. I ascended stairs to the second floor of the exhibit, where I quickly noticed four older men and women collectively peering over the balcony, watching old runway shows on the projector, as if they were reliving the end of an era. The convention of highly detailed form-fitting designs and the relentless striving for glamour has always been a model the high-end label Bellville Sassoon has remained true to; demonstrated by the versatility in the brand’s evening wear. So, arguably, it may be the end of an era, after all. By the time I reached to the end of the exhibit I felt the bridge between classic elegance of Bellville Sassoon and the chosen novels. Even without prior knowledge of some of the novels used throughout the exhibit, the retrospective clearly highlights the significance fashion has had on culture as a whole. 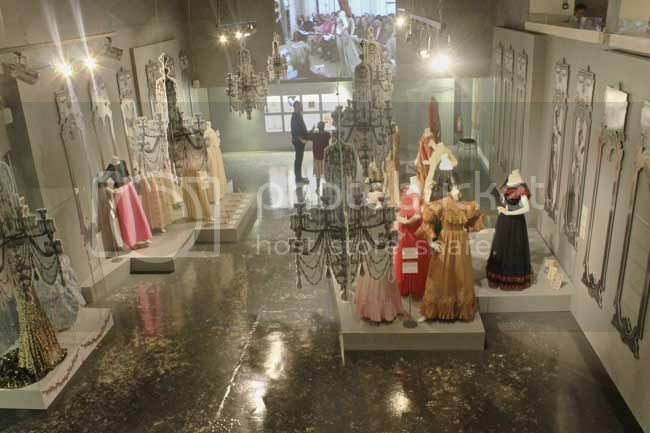 This exhibition curated by writer and journalist Sarah Vine runs until 11th January 2014 at the Fashion Textile Museum on Bermondsey Street, London.